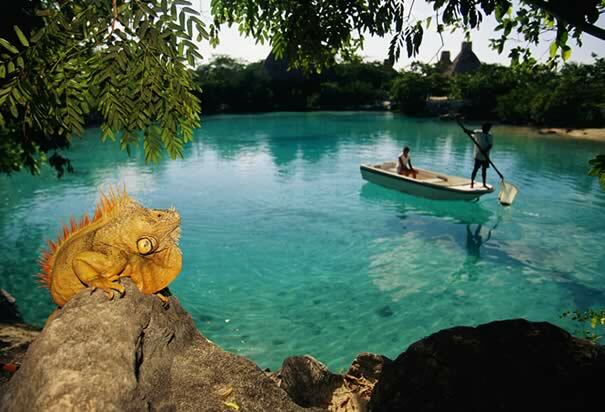 The amazing state of Quintana Roo and the Yucatán Peninsula are filled with some amazing treasures. The best way to experience these wonders are to see them in person, but we think the next best thing is this amazing video! Here is a little bit more information about the places shown in the video. Holbox, meaning “black hole” in Mayan, is a small island located on the northern coast of the Yucatán Peninsula. Not quite a large tourist attraction yet, Holbox is mostly known for its tours of swimming with whale sharks. Located on the southern part on the island of Cozumel, Parque Arrecifes mostly attracts scuba divers and snorkelers and has a wide range of marine life. Bacalar is famously known for it’s 7-colored lagoon and striking blue colors. The limestone-bottomed lagoon is fed by cenotes and underground rivers. Tulum is home to the famous site of the Mayan ruins built overlooking the Caribbean Sea. Isla de las Golondrinas translates to “Island of the Swallows” and is Mexico’s largest Caribbean island. Parque Chanakaab, translated to “Little Sea,” is one of Cozumel’s top attractions and is located inside of Cozumel’s National Marina Park. Enjoy beach activities as well as scuba diving and snorkeling at this local treasure. If you are ready to visit any or all of these places book your Cancun vacation here!